We were pleased with our young team of calves at the Winter National Show, held at the end of October in conjunction with Borderway Agri-Expo, Carlisle. The best from our team was Rosslayne Nellie P274, who stood second in a strong baby heifer class. Born April 2014, she’s by Jerusalem Wellington L191 and out of Rosslayne Nellie H065, dam of retained herd sire Nevada M206. The standing fourth in a very strong bull calf class was the April-born Rosslayne Royal Emblem P267. This one is by our home bred stock bull Phantom L151 and is out of Caldwell Rosa Erica H873. Our pen of 5 bullocks sold well at Dumfries Livestock Mart yesterday. For an average age of 18 months and weighing 600kg off grass only, they topped the sale at £1245. Heifers topped at £1095 for a pen of 5 weighing 515kg. Some 17 store bullocks and heifers averaged £1145. Rosslayne Precision N241 is the latest of our Lord Jellicoe sons to have been sold off farm. This one is out of Rosslayne Primula G039, a Kincardine Castle Emesco B143 daughter. Buyers here were regular purchases Tanlawhill Estates, Langholm. This month also saw us welcome the Solway Angus Club to the farm for the club’s annual stock judging afternoon,which as always, was a great occasion. Two bulls have been sold off the farm this month, the first to go this month was Rosslayne Evolution N250, a May 2013-born Lord Jellicoe son out of the Young Dale Touchdown 36M daughter Kitewood Evas Honey H063, he has been sold to Messrs Egan of Southwaite, Penrith. Then selling to new customers Messrs Whittam, Waterbeck, Lockerbie, was Rosslayne Allstar N244. This one is another Lord Jellicoe son, out of the Idvies Blade C126 daughter Caldwell Annie G732. We’d like to wish both buyers the very best with their purchases and look forward to hearing how the bulls perform. 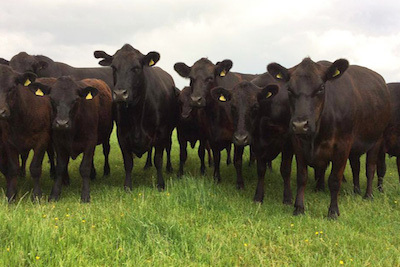 This month saw the Rosslayne herd host our first Angus Club farm walk and we were delighted to welcome the PENWAC Club. We thoroughly enjoyed showing a knowledgeable and enthusiastic group around our cattle and look forward to hosting many more club visits in the future. Exciting times ahead for Rosslayne as we’ve started calving to the home bred Rosslayne Phantom L151 and also Wellington L192. 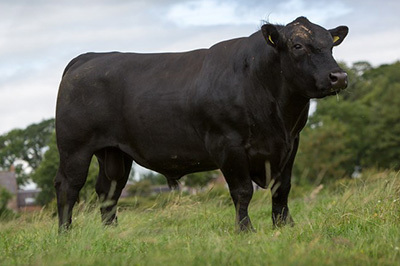 Both bulls have matured in to just the type of bull we look for at Rosslayne – they have size, frame, natural fleshing, good legs and feet and great breed character, so will hopefully knit well with our types of cows. Selling this month privately off farm was Rosslayne Navarra M202, who heads to regular purchasers Messrs Helliwell, Keysmount, Longtown, Carlisle. This May 2012-born Kincardine Castle Judge Eric G596 son is out of Rosslayne Nellie G046, a Kincardine Castle Emesco B143 daughter. The May 2012-born Rosslayne Phaeton M205 has sold this month to Messrs Anderson, Stouslie, Hawick. By Jerusalme Lord Jellicoe G116, he’s out of Kincardine Castle Primula B190, who is a daughter of Wederlie Elliot Z082, making him full brother to Rosslayne Phantom L151, who was a previous reserve male calf champion at the Winter National Show. Rosslayne Angus had an excellent day’s trading at one of the main store cattle sales held at Dumfries Mart this month. We had forward 20 bullocks and heifers and sold to a top of £1470 and an overall average of £1052. Sales of bulls privately off the farm have been continuing at a pace and the latest to leave the farm is Rosslayne Pegasus M191, who has a new home with Messrs Marrs, Little Orton, Carlisle. 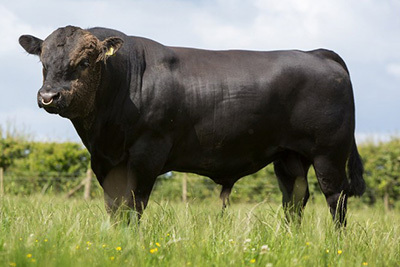 It’s always good to deal with new customers, so we’re delighted to sell this bull to the Marrs family. He’s another son of Lord Jellicoe, but is out of a home bred daughter of Kincardine Emesco B143.